Globorotalia pachyderma (Ehrenberg). Vilks, 1975, p. 321, pl 1 figs.1-3 & pl 2 figs. 1-3. Neogloboquadrina pachyderma (Ehrenberg). Kennett & Srinivasin 1980, p 148 pl 3 figs 1-13. 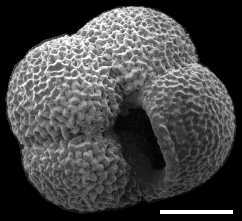 Remarks: The most abundant planktonic foraminifer of high latitudes; as any planktonic foraminifer, avoids low-salinity and shallow waters. The left-coiled morphotype prevails at lowest temperatures and occurs throughout the Arctic Ocean. On the Barents-Kara shelf, tests of N.pachyderma are abundant mostly in sediments underlying Atlantic-derived waters, that is, in troughs 300-600 mwd extending from the continental margin to the shelf interior.